Roman Catholic Church | COURAGE FOR AMERICA! Tea drinkers can stop practicing tasseography. There is nothing to decipher in “Pope” Francis’s statements. It’s all very clear. Denouncing abortion, homosexual “marriage” and contraception, is simply not his cup of tea. 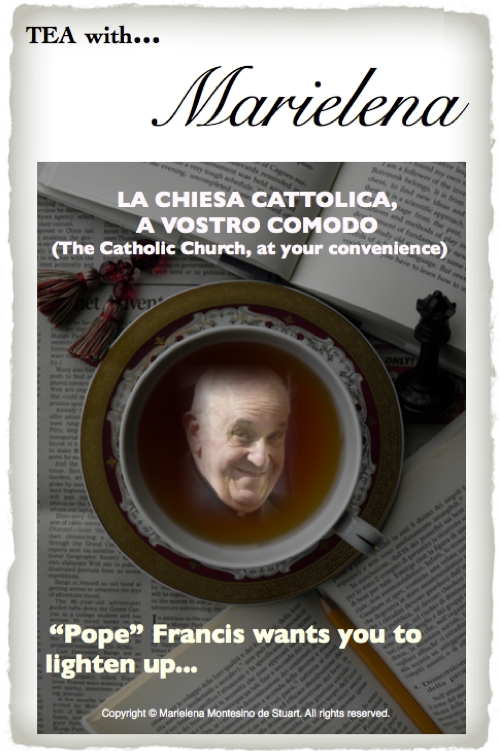 This is why I decided to title this commentary, “La Chiesa Cattolica, a vostro comodo” (The Catholic Church, at your convenience)– as a reflection on the statements made by “Pope” Francis during an interview, on August 19, with Antonio Spadaro S.I, Director of La Civiltà Cattolica. The interview was published on September 19. Two original excerpts, in Italian, and my translations, are presented below. «La Chiesa a volte si è fatta rinchiudere in piccole cose, in piccoli precetti». HOLY MOTHER OF GOD, PLEASE HELP US. STOP giving the innocent unborn lip service! STOP your farcical “pro-life” proclamations from your gilded offices at the 16th century Palazzo della Cancelleria — and from the Ritz Carlton! Cardinal Raymond Burke says that Irish Catholic politicians who support abortion should not receive Holy Communion. Good, it’s about time; however, this is not the first time he makes this public proclamation. Remember John Kerry during the 2004 presidential campaign? Was anything done about it? NO. In fact, pro-abortion John Kerry, along with pro-abortion Chris Dodd and pro-abortion Ted Kennedy, received Holy Communion at none other than Benedict XVI’s Papal Mass in Washington DC, on April 17, 2008. http://www.lifesitenews.com/news/archive//ldn/2008/apr/08041707. Cardinal Burke may not have been responsible for these three pro-abortion politicians receiving Holy Communion; however, his double-standard, as explained below, does not lend credibility to the recent admonition he issued to Irish politicians. “The Catholic community and Catholic institutions should not honor those who act in defiance of our fundamental moral principles. They should not be given awards, honors or platforms which would suggest support for their actions.” [emphasis added]– From Catholics in Political Life (USCCB 2004). Thomas S. Monaghan is the Catholic Founder and Chancellor of Ave Maria University. On November 5, 2009 a pro-abortion billionaire/politician was honored on the campus of Ave Maria University– in exchange for a gift of $4 million. This billionaire/politician also has a notorious history of giving breathtaking financial support to pro-abortion politicians—including Barack Obama. Ironically, he also funds children’s hospitals. This is typical of powerful individuals without a well formed conscience. They cannot make consistent moral and ethical choices. Now read about Cardinal Burke’s participation in Thomas S. Monaghan’s Legatus “summit” at the Ritz Carlton Beach Resort in Naples, FL., in February 2012. http://www.ncregister.com/daily-news/legatus-celebrates-25-years/ . Legatus is an organization founded by Thomas S. Monaghan “designed exclusively for top-ranking Catholic business leaders and their spouses“. Did Cardinal Burke issue the same public admonition at the Ritz-Carlton Beach Resort, regarding Holy Communion? Has he administered the same public medicine to “conservative” wealthy lay Catholics in positions of leadership, who honor pro-abortion billionaire/politicians in exchange for money? Please, Cardinal Burke— inquiring Catholic minds want to know! Cardinal Burke’s words mean nothing. His actions—and the company he keeps– speak loud and clear. It is nauseating to see powerful members of the Church’s hierarchy issuing farcical proclamations against abortion. The innocent unborn being murdered, deserve better. This is a tragic reality for Roman Catholics who may not be aware of the double-standards practiced by some of the Church’s highest ranking prelates—considering that Cardinal Raymond Burke is the current Prefect of the Supreme Tribunal of the Apostolic Signatura—which is the highest judicial authority in the Catholic Church– apart from the Pope himself. Of course… for those who are unable to make moral distinctions, it is often easier to dismiss or ignore the facts. But those who have the courage to stand for truth must never be afraid. They must always stand on the side of God. As a practicing Roman Catholic – I must say – that if Cardinal Raymond Burke is considered about the best that we have in the leadership of the Catholic Church—then God help us all. There is turbulence all around us, as we see society descend further into materialistic atheism, while the lives of millions of innocent babies are threatened by abortion. Our hearts are broken—but we must remain determined to defend innocent human life, without exceptions, until the Kingdom of Christ– and His love–rule this earth. – Abortion is murder. No exceptions. – Don’t be afraid of the world or public opinion. Stand for the truth. Stand with God. – What is happening around the Throne of Peter? – Promote and educate others about the Kingdom of Christ– the only hope for this world. In 1492, after victory over Muslim rule, Isabella I (la Católica) understood that it was up to her to pursue the germinative idea of greatness for Spain, under a recently united, albeit poor Christian Spain. Today, it is important to remember this extraordinary woman– and her aspiration to bring great honor and glory to her nation, a patriotic virtue which is being lost more and more, as the world succumbs to Socialism. We also honor the courageous man who served under this crown– and sailed into the unknown, changing forever our sense of taste, smell and our view of the world. As a practicing Roman Catholic I have written articles about the “modernist” corruption inside the Catholic Church. The series is titled “The Impostors“. I have chosen to remain a Catholic and expose the corruption– because I do not believe in running away. The Church is holy– THE MODERNISTS AND IMPOSTORS WITHIN, ARE NOT. THE TIME HAS COME TO EXPOSE WHO THEY ARE AND RUN THEM OUT– MUCH LIKE WE HAVE TO EXPOSE AND RUN OUT OF WASHINGTON DC THE GLOBALIST IMPOSTORS ACTING AS LEGISLATORS, WHO ARE DESTROYING AMERICA FROM WITHIN. Today’s news about another impostor, Father Benedict Groeschel, is not surprising. In an interview with the National Catholic Register, Groeschel claimed (among several barbaric remarks) that in a lot of pedophilia cases, the youngster is the “seducer”. After the scandal grew legs– the usual apology was issued. What’s new? Not only are these individuals incompetent as priests– but their duplicity is alarming. Father Groeschel has been a member of the Ave Maria University Board of Trustees. Groeschel has been paraded around Ave Maria (including inside the K-12 school). You would think they were parading a saint. But for those of us who know full well who these “impostors” are– Groeschel is NO SAINT– and CERTAINLY no voice for tradition or orthodoxy. Now, watch the spin unfold before your very eyes– with the suggestion of senility, as a result of his morally bankrupt and offensive remarks. Please don’t be fooled by the damage-control. Groeschel is an extremely articulate psychologist– and may I add– astute, experienced, engaged and media-savvy. The accident that is being used as an excuse for his remarks took place YEARS AGO– after which HE REMAINED EXTREMELY ACTIVE IN MEDIA WORK. They also claim he had a stroke– but that certainly has not kept him from articulating his analysis of pedophilia as an experienced psychologist. You see, lately these impostors are repackaged as being senile– and then suddenly, they die– as in the scandal involving Cardinal Bevilacqua in Philadelphia, who was managing millions (if not billions) of dollars for Benedict XVI’s Papal Foundation, while those protecting him claimed he was senile. A very convenient excuse indeed– after overwhelming accusations surfaced regarding Bevilacqua’s involvement in covering up the sexual abuse of countless children. When the District Attorney of Philadelphia turned up the heat– Bevilacqua turned up dead. Then, there are the lay Catholics who look the other way, as they ride the coattails of the Church’s hierarchy in hopes of landing plum jobs. Others network with Bishops and Cardinals in order to sell lectures, projects and programs– with the arrogant excuse that “they are making a difference”– while ignoring compelling reports of sexual abuse of children by members of the clergy– as well as cover-ups. The real “difference” that needs to be made is to denounce these monsters and impostors. But you see, Catholicism has become a lucrative business– a buyer-beware minefield where many charlatans prey on well-intentioned Catholics. Now, let’s take a look at Cardinal Timothy Dolan (New York)– who is paraded as the “new breed” of conservative Cardinals coming out of the Holy See. YES… “THE” CARDINAL DOLAN WHO OFFERED THE CLOSING PRAYERS AT THE REPUBLICAN NATIONAL CONVENTION LAST NIGHT. OH YES… Cardinal Dolan is president of the United States Conference of Catholic Bishops (USCCB) and Cardinal-Archbishop of New York. As in Washington DC, the current corruption inside the Catholic Church begins at the top– and flows down.